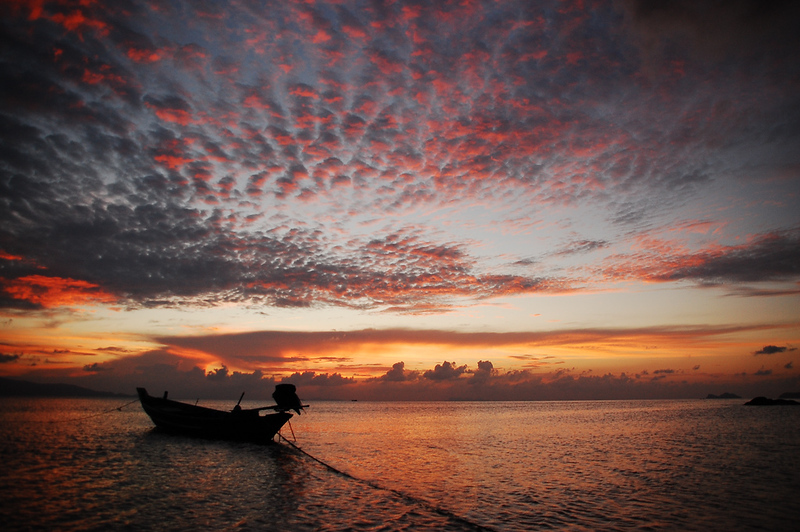 Although it’s best known for its monthly Full Moon Party, Koh Phangan has a lot more to offer than just wild nightlife. The island is mountainous, naturally beautiful and quieter and less developed than nearby Koh Samui, Koh Phangan is home to some of the Gulf of Thailand’s best beaches. From inexpensive beachside bungalows to luxury resorts, a huge range of hotels and resorts are available on Koh Phangan, making this beautiful and quiet island a great choice for luxury and budget travellers alike. 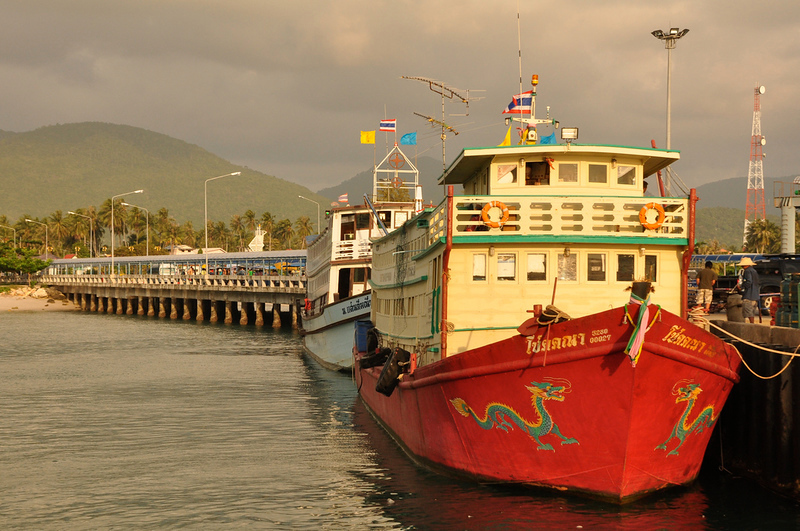 Koh Phangan’s administrative centre and port, Thong Sala is where you’ll exit the ferry from Koh Samui or Surat Thani. Thong Sala is home to most of Koh Phangan’s administrative and safety related centres, such as the island’s police station and international hospital. Stretching along much of Koh Phangan’s southeastern coast, Ban Tai Beach is a long beach that offers fantastic views of the sunset. A range of resorts, hotels and restaurants are located along the beach, making it a convenient place to stay. One of Koh Phangan’s more relaxing beaches, Ban Kai Beach is located in between Ban Tai Beach and Haad Rin, home of Koh Phangan’s infamous full moon parties. Ban Kai is home to a good selection of hotels and resorts, as well as beachfront restaurants and vendors. Although Haad Rin Beach is best known for its Full Moon Party, this beautiful beach has a lot more to offer than just drinks and beachfront clubbing. Haad Rin offers a mix of natural beauty and convenience, with a great selection of restaurants, bars and shops close to the beach. Located on Koh Phangan’s quiet eastern coastline, Haad Yao Beach is a naturally beautiful beach that’s well known for its great snorkelling. Clear water and a reef located just off the beach make this Haad Yao one of the best beaches in Koh Phangan for snorkellers. Quiet and clean, the twin beaches of Thong Nai Pan Noi and Thong Nai Pan Yai are great for sunbathing and enjoying Koh Phangan’s natural beauty. 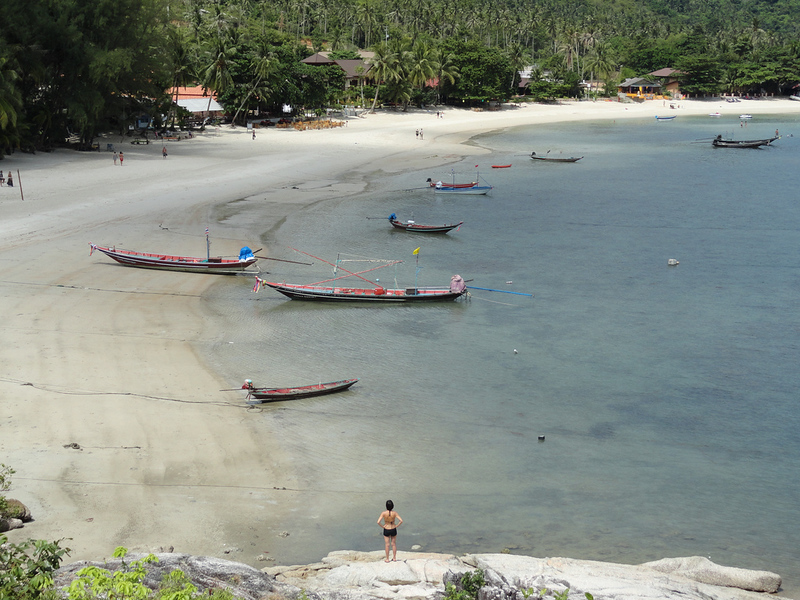 Thong Nai Pan Noi is the busier of the two beaches thanks to its deep water and relaxed beachside atmosphere. Use the search box below to find out departure times and prices on your selected travel dates to Koh Phangan. Koh Phangan’s beaches range from heavily developed to almost completely hidden, making it a great place to relax and sunbathe. 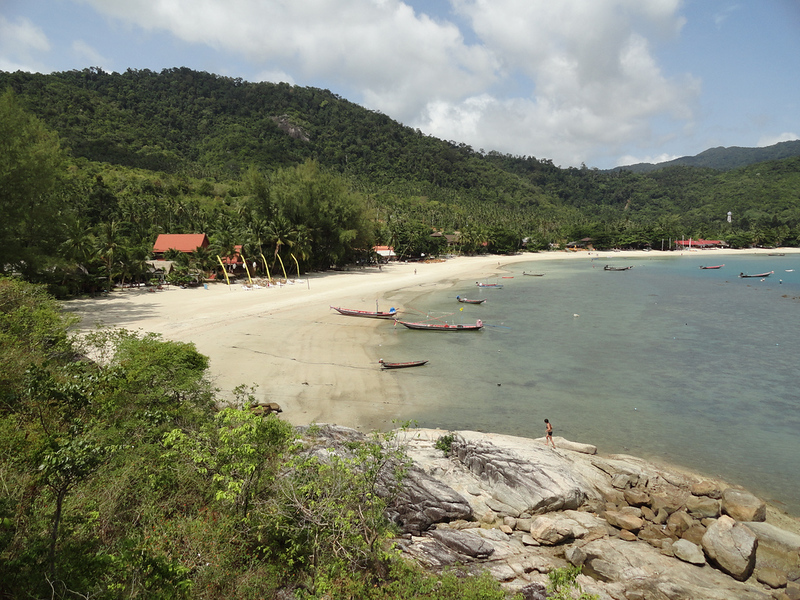 Haad Rin Beach is the most crowded on the island, while Haad Yao and Thong Nai Pan offer a quieter and more relaxed atmosphere. Koh Phangan’s clear water makes it a great place to snorkel. Good snorkelling is possible off the beach at Haad Chao Phao and Haad Yao. For the best visibility and the most diverse sea life, you’ll want to book a snorkelling tour to one of the numerous nearby snorkelling spots. Koh Phangan is located close to several of the Gulf of Thailand’s best dive sites, including the well known Sail Rock. Numerous dive shops offer PADI and SSI dive courses, chartered dive trips and even wreck and night dives. Koh Phangan is famous for its great beaches and relaxed lifestyle, but it’s infamous for its Full Moon Party — a huge monthly party that attracts as many as 30,000 people. The party is held in Haad Rin, although a number of other parties are held across the island on different dates. If you can handle the heat, Koh Phangan is one of the most rewarding islands in Thailand for hiking. From the Khao Ra viewpoint to undiscovered beaches, several tour operators on Koh Phangan offer guided hikes to some of the island’s most scenic points. There’s no better way to experience Koh Phangan’s beautiful blue water than from a private yacht. Chartered sailing trips are available from Itsaramai, while Red Star Sailing offers fast, exciting and adventurous catamaran tours around Koh Phangan and the surrounding area. Several Muay Thai gyms operate on Koh Phangan, offering everything from beginner classes to one-on-one coaching. Good options include Chorenrit Muay Thai Camp, which is located in Thongsala, and Diamond Muay Thai near Nai Wok Beach. Anantara Rasananda Resort and Spa offers a selection of luxurious rooms and villas that are some of the most impressive on Koh Phangan. A seafront infinity pool, private yoga classes and beautiful spa make this one of Koh Phangan’s most luxurious places to stay. Conveniently located on Ban Tai Beach, Santhiya Koh Phangan Resort and Spa offers a mix of rooms, suites and luxurious private villas. A beachfront swimming pool and spa make this a fantastic place to escape from civilisation and enjoy Koh Phangan’s beautiful surroundings. The Coast Resort is a luxurious ultra-modern resort on Ban Tai Beach. With sleek modern furnishings, a seafront swimming pool with swim-up bar and incredible views of the sunset, The Coast is one of Koh Phangan’s most luxurious properties. Located a short distance from Ban Tai Beach, Moonstone Studio is a small boutique hotel that offers a selection of spacious studio apartment rooms. Guests can walk to Haad Rin within 15 minutes, making Moonstone Studio a convenient option for couples and solo travellers. Fantastic views over Haad Salad and a truly incredible location make Salad Hut Resort one of Koh Phangan’s best mid-priced hotels. Located on quiet Haad Salad — literally “Pirate Beach” — this hotel is just a few steps away from the beach. Palita Lodge offers a good selection of rooms, suites and villas right on Haad Rin Beach. The large swimming pool and beautiful garden surroundings make Palita Lodge a relaxing place to stay, even if the Full Moon Party is almost on its doorstep. Located less than five minutes from Haad Rin Beach, Thai Dee Garden Resort offers fan and air conditioned bungalows and private rooms. This hotel’s convenient location and affordable rooms makes it a great choice for travellers that want to be close to Haad Rin. Sea Love Bungalows provides a selection of inexpensive bungalows steps away from Ban Tai Beach. Air conditioned and fan bungalows are available at fair prices. The resort’s restaurant offers a great choice of Thai dishes right on Ban Tai Beach. Located less than a minute from quiet and beautiful Ban Kai Beach, Blue Lotus Resort offers a selection of fan and air conditioned bungalows. Rooms are clean and simple, set in a quiet garden environment that makes Blue Lotus Resort a peaceful place to stay. Fisherman’s Restaurant and Bar serves a selection of great Thai seafood dishes just metres from Ban Tai beach. Beachfront dining and beautiful sunsets make this restaurant perfect for romantic dinners. Located close to Thong Nai Pan Noi, Luna Lounge offers a menu made up of Thai classics and international dishes, accompanied by a selection of strong and tasty cocktails. La Dolce Vita serves excellent Italian food in a beautiful setting. 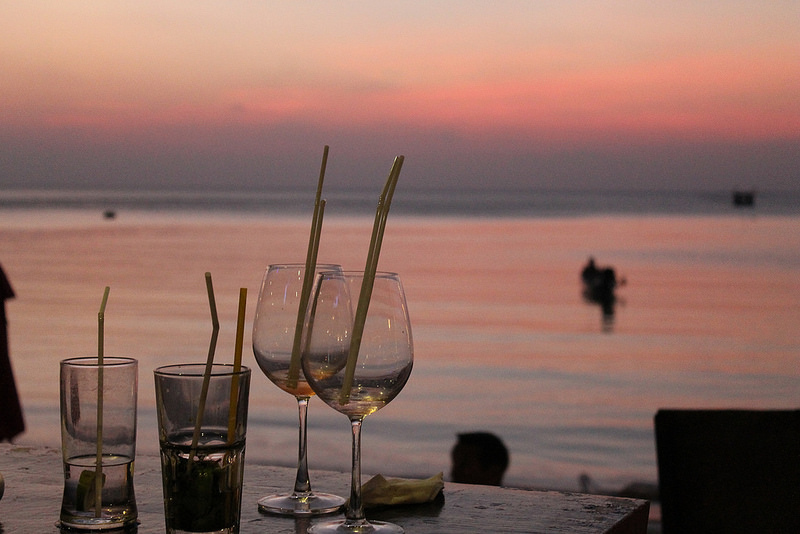 With a view of the sunset on Chao Phao Beach, La Dolce Vita is one of Koh Phangan’s best options for romantic dining. If you’re in need of a break from Thai food, Peppercorn is an excellent choice. This Western restaurant on Haad Salad serves excellent steak, great desserts and a selection of cocktails. CRAVE Restaurant and Lounge serves strong cocktails and excellent American BBQ. If you have a craving for ribs, steak or a burger, this restaurant on Haad Yao is the place to visit. Alex Restaurant is a simple, unpretentious Thai restaurant near Haad Salad that serves great seafood. Fish is brought in fresh from the local market to prepare many of Alex’s dishes. Popular with tourists and Koh Phangan locals alike, Nong Tang in Thong Sala is one of Koh Phangan’s most popular Thai restaurants, serving a menu of Thai dishes and fresh seafood. Although Koh Phangan has no airport of its own, it’s a short one-hour ferry trip from nearby Koh Samui. Ferries depart frequently from Koh Samui’s Big Buddha pier and Nathon, with Songserm tickets priced at 200 baht and Lomprayah Catamaran tickets 300 baht. Several ferries connect Surat Thani and Koh Phangan. The overnight ferry leaves from Surat Thani at 11 pm nightly and arrives in Koh Phangan at 6 am. Tickets, which include a mattress for sleeping, are priced at 400 baht per person.Seatran and Lomprayah ferries depart from Surat Thani several times daily for Koh Samui before continuing to Koh Phangan. The daily Lomprayah Catamaran service from Donsak departs at 12:30 pm daily, arriving at Koh Phangan at approximately 2 pm. 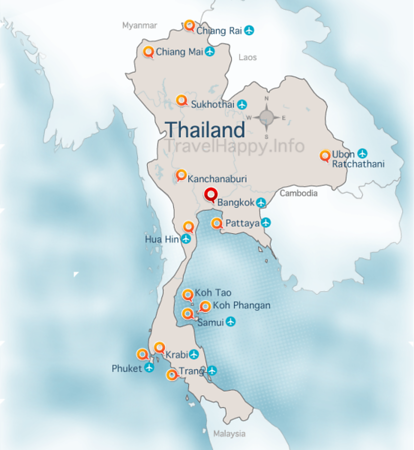 The nearest airport to Koh Phangan is Koh Samui. Check Skyscanner to compare airlines for the best prices and flight times to Koh Phangan.